“Ah yes, The Hankenstein. He was s-o-o-o-o hip.” That was the response of Dexter Gordon when the late Hank Mobley’s name came up in conversation a while ago. “Hankenstein” - as in identifying Mobley as a genuine “monster” in the best sense of the term, while the slow motion relish of “he was s-o-o-o-o hip” seemed to have both musical and extramusical connotations. But then, like so many who came to know Mobley’s music, Gordon decided to qualify his phrase echoing critic Leonard Feather’s assessment that Mobley was “the middleweight champion of the tenor saxophone,” whose approach to the instrument (according to Feather) lacked the “magniloquence” that Gordon, Sonny Rollins, and others had brought to it. "Don't get backed too much into a reality that has fashioned your senses with too many realistic claims. When art promises you this sort of reliability, drop it. It is good to know how not to know how much one is knowing." 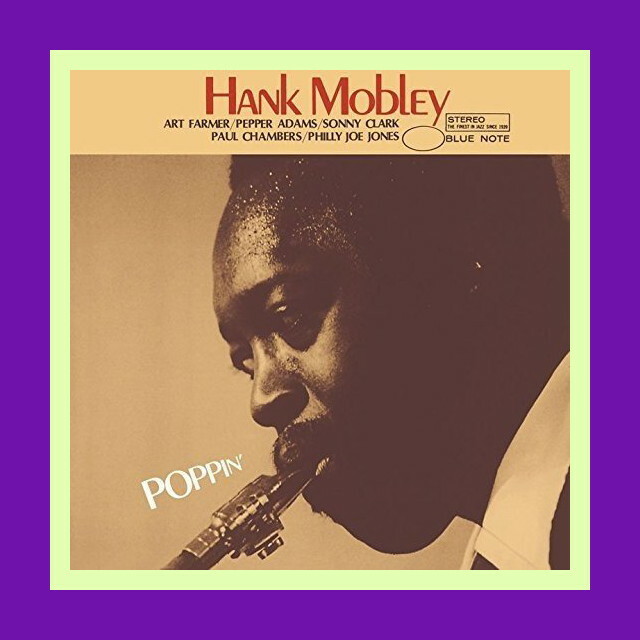 My ongoing Mobley Quest takes a slightly different spin at this point with the emphasis being placed on just one of Hank’s many recordings as a leader for Blue Note [There were 24 in all.]. I plan to do this for more of Hank’s individual Blue Note recordings especially when the accompanying insert notes warrant highlighting because of the significant light they shine on understanding Hank and his music, both of which have been ignored for far too long, hence my quest to bring more attention to them. Larry Kart’s notes to Poppin’ one of Hank’s earliest Blue Note LPs that was very late to CD issuance certainly fall into this category as they are a masterful revelation of what makes Hank’s approach to Jazz singular and unique. One of the tunes on this date is Gettin’ Into Something and Larry certainly does that and more with his analysis of, not only of what makes Mobley tick, but also of what are the defining qualities of the styles of the other musicians on the album. Both the following essay and the later, 1987 piece on Hank can be found in Larry’s Jazz in Search of Itself [New Haven: Yale University Press, 2004]. Here’s a link to Larry’s “Hank Mobley - A Posthumous Appreciation” which was posted earlier on these pages. The first of these two pieces was the liner notes for a reissue of Hank Mobley's 1957 album Poppin'. (The reference there to Nietzsche supposedly commenting on Mobley's style was a would-be serious joke. Nietzsche did write those words, in his essay "Contra-Wagner," but he was referring to the music of Georges Bizet.) The second piece was a posthumous appreciation. “In the mid-1950s the Blue Note label yielded momentarily to super-salesmanship, releasing such albums as The Amazing Bud Powell, The Magnificent Thad Jones, and The Incredible Jimmy Smith. That trend was dormant by the time Hank Mobley became a Blue Note regular and unfortunately so — a record titled The Enigmatic Hank Mobley would have been a natural. "To speak darkly, hence in riddles" is the root meaning of the Greek word from which "enigma" derives; and no player, with the possible exception of pianist Elmo Hope, has created a more melancholically quizzical musical universe than Mobley, one in which tab A is calmly inserted in slot D.
Though he was influenced by Charlie Parker, Sonny Stitt, and, perhaps. Lucky Thompson, Mobley has proceeded down his own path with a rare single mindedness, relatively untouched by the stylistic upheavals that marked the work of his major contemporaries. Sonny Rollins and John Coltrane. In the words of Friedrich Nietzsche, not previously known for his interest in jazz, Mobley's music is "without grimaces, without counterfeit, without the lie of the great style. It treats the listener as intelligent, as if he himself were a musician. I actually bury my ears under this music to hear its causes." And that is the enigma of Mobley's art: In order to hear its causes, the listener must bury his ears under it. In a typical Mobley solo there is no drama external to the developing line and very little sense of "profile"— the quality that enables one to read a musical discourse as it unfolds. Not that high-profile players — Rollins and Dexter Gordon, for example — are necessarily unsubtle ones. But to understand Mobley the listener does have to come to terms with complexities that seem designed to resist resolution. First there is his tone. Always a bit lighter than that of most tenormen who worked in hard bop contexts, it was, when this album was made, a sound of feline obliqueness — as soft, at times, as Stan Getz's but blue-gray, like a perpetually impending rain cloud. Or to put it another way, Mobley, in his choice of timbres, resembles a visual artist who makes use of chalk or watercolor to create designs that cry out for an etching tool. Harmonically and rhythmically, he could also seem at odds with himself. For proof that Mobley has a superb ear, one need listen only to his solo here on "Tune Up." Mobley glides through the changes with ease, creating a line that breathes when he wants it to, one that that is full of graceful yet asymmetrical shapes. And yet no matter how novel his harmonic choices were — at this time he surely was as adventurous as Coltrane — Mobley's music lacks the experimental fervor that would lead Coltrane into modality and beyond. Mobley's decisions were always ad hoc, and from solo to solo, or even within a chorus, he could shift from the daring to the sober. What will serve at the moment is the hallmark of his style; and thus, though he is always himself, he has in the normal sense hardly any style at all. Even more paradoxical is Mobley's sense of rhythm. His melodies float across bar lines with a freedom that recalls Lester Young and Charlie Parker, and he accents on weak beats so often (creating the effect known in verse as the "feminine ending") that his solos seem at first to have been devised so as to baffle even their maker. That's not the case, of course, but even though he has all the skills of a great improviser, Mobley simply refuses to perform the final act of integration; he will not sum up his harmonic, rhythmic, and timbral virtues and allow any one element to dominate for long. In that sense he is literally a pioneer, a man whose innate restlessness never permits him to plant a flag and say, "Here I stand." Thus, to speak of a mature or immature Hank Mobley would be inappropriate. Once certain technical problems were worked out — say, by 1955 — he was capable of producing striking music on any given day. New depths were discovered in the 1960s and the triumphs came more frequently; but in late 1957, when Poppin' was recorded, he was as likely as ever to be on form. Much depended on his surroundings, and the band he works with here has some special virtues. The rhythm section is one of the great hard bop trios, possessing secrets of swing that now seem beyond recall. Philly Joe Jones and Paul Chambers, partners, of course, in the Miles Davis Quintet, shared a unique conception of where "one" is — just a hair behind the beat but rigidly so, with the result that the time has a stiff-legged, compulsive quality. The beat doesn't flow but jerks forward in a series of spasmodic leaps, creating a climate of nervous intensity that was peculiar to the era. Either the soloist jumps or he is fried to a crisp on the spot. As a leavening element there was Sonny Clark — equally intense but more generous and forgiving in his patterns of accompaniment. Clark leads the soloists with a grace that recalls Count Basie, and his own lines, with their heartbreakingly pure lyricism, make him the hard bop equivalent of Duke Jordan. The ensemble sound of the band, a relatively uncommon collection of timbres heard elsewhere on Coltrane's and Johnny Griffin's first dates under their own names, gives the album a distinctive, ominous flavor; but this is essentially a blowing date. Art Farmer, for my taste, never played as well as he did during this period, perhaps because the hard bop style was at war with his pervasive sense of neatness. Possessing a musical mind of dandiacal suavity, Farmer at times sounded too nice to be true. But this rhythm section puts an edge on his style (as it did a few months later on Clark's Cool Struttin'), and I know of no more satisfying Farmer solo than the one preserved here on "Getting Into Something," where he teases motifs with a wit that almost turns nasty. Adams's problem has always been how to give his lines some sense of overall design, and too often the weight of his huge tone hurtles him forward faster than he can think. But when the changes and the tempo lie right for him, Adams can put it all together; and here he does so twice, finding a stomping groove on "Getting Into Something" and bringing off an exhilarating doubletime passage on "East of Brooklyn." As for the leader, rather than describing each of his solos, it might be useful to focus first on a small unit and then on a larger one. On the title track, Mobley's second eight-bar exchange with Jones is one of the tenorman's perfect microcosms, an example of how prodigal his inventiveness could be. A remarkable series of ideas, mostly rhythmic ones, are produced (one might almost say squandered) in approximately nine seconds. Both the relation of his accented notes to the beat and the overall pattern they form are dazzlingly oblique, and the final, whiplike descent is typically paradoxical, the tone becoming softer and more dusty as the rhythmic content increases in urgency. In effect we are hearing a soloist and a rhythm player exchange roles, as Mobley turns his tenor saxophone into a drum. On "East of Brooklyn" Mobley gives us one of his macrocosms, a masterpiece of lyrical construction that stands alongside the solo he played on "Nica's Dream" with the Jazz Messengers in 1956. "East of Brooklyn" is a Latin-tinged variant on "Softly as in a Morning Sunrise," supported by Clark's "Night in Tunisia" vamp. Mobley's solo is a single, sweeping gesture, with each chorus linked surely to the next as though, with his final goal in view, he can proceed toward it in large, steady strides. And yet even here, as Mobley moves into a realm of freedom any musician would envy, one can feel the pressure of fate at his heels, the pathos of solved problems, and the force that compels him to abandon this newly cleared ground. In other words, to "appreciate" Hank Mobley, to look at him from a fixed position, may be an impossible task. He makes sense only when one is prepared to move with him, when one learns to share his restlessness and feel its necessity. Or, as composer Stefan Wolpe once said, "Don't get backed too much into a reality that has fashioned your senses with too many realistic claims. When art promises you this sort of reliability, drop it. It is good to know how not to know how much one is knowing." Just to be clear, that passage in the liner notes from Nietzsche was a kind of serious joke. Nietzsche did write those words but not of course about Mobley but about Bizet, composer of "Carmen." When I ran across them, they fit some of what I thought about Mobley so well that I couldn't resist quoting them.